Pay For Advice Or For Using a Screwdriver? I bought a full set of appliance when I moved into my current home in 2002: a washer, a dryer, and a refrigerator. Not knowing any better, I bought all of them Kenmore brand at Sears. They seem to be reaching the point of failure after 11 years. First it was the refrigerator. The compressor was making a clunking noise when the cycle stopped. I called a repair shop and they said a spring inside the compressor was shot. It would cost $600 to replace the compressor and repack the refrigerant. I decided to live with it until one day the noise became constant when the compressor was running. I had to buy a new refrigerator in a hurry. A month later my washer broke. After washing one load it decided to quit on the second load. It pumped water in but the drum just didn’t move no matter what. I had to haul my clothes soaked with detergent to a coin laundry place to finish them. I found a repair technician on Yelp. He did some tests with a multimeter. “A bad timer.” he said. It would cost $250 for part and labor. Considering that I would have to spend upward to $1,000 to buy a new washer that doesn’t match with my dryer, I thought it would be worth $250 to do the repair. A few days later he came with the timer and he replaced it. But it didn’t work. The drum still didn’t move. He put the old timer back and he said it must be the motor control board. At this point my confidence in this technician had diminished. It sounded like he was doing trial and error. But I still went along and I asked him to give me an estimate for replacing the control board. He called me the next day saying he had found the part but it would be $100 more, for a total of $350. Not confident that it would really fix it this time, I decided to stop engaging with this technician and just pay him for the service call. That was $60. I still had a broken washer. Having watched him open up the washer, I decided to take it to my own hands. I practiced skills I learned from the days I assembled my desktop PC, which primarily involved using of a Phillips screwdriver. I opened the washer up, found the motor control board, and I pulled it out. I saw there was a fuse on the board. I tested it. It was blown. I bought 5 pieces of the fuse of the same rating (250V 12A slow-blow ceramic) for $4 on eBay. I put a good one in but the washer still didn’t work. I also found out that the good fuse I put in was immediately blown. Something must have shorted on the board causing the fuse to blow. Time to replace the board. 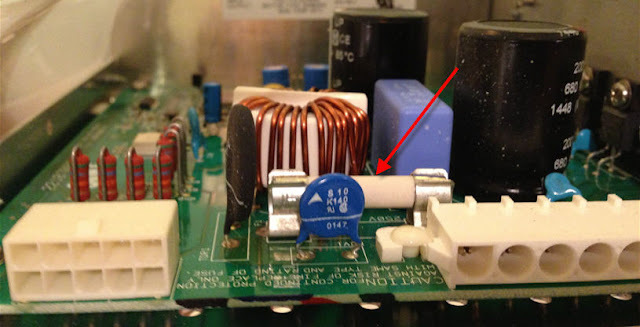 I found the right board online from AppliancePartsPros.com. With tax and shipping it comes out to $160. I put it in and the washer is working again! The moral of this long story? Paying the repairman $60 for the diagnosis pointed me to the right direction although his first diagnosis was incorrect. Paying him another $290 would’ve fixed it too but it would be much more expensive than buying the part and replacing it myself. I wonder why he didn’t give me that option. All it took was really just taking off some screws and putting them back in. The electrical plugs are designed such that it’s impossible to plug in the wrong way. If I were a fiduciary washer repair advisor I would diagnose the problem and then say here’s where you buy the part and just go do it because it’s really simple. Making another trip out would be inefficient for both him and me, but he’d rather charge me another $130 beyond the cost of the part for working with screws. He probably gets the part for less than I do too. Paying for financial advice would be the same thing. If you want advice, pay for advice. That’s the most valuable part. You don’t need someone to “manage” the account and do the trades or fill out forms for you. You can enter the trades or fill out forms yourself as easily as you can use a screwdriver. Most advisors, however, would rather just do it for you, because that’s where the money is, just like my washer repair person. 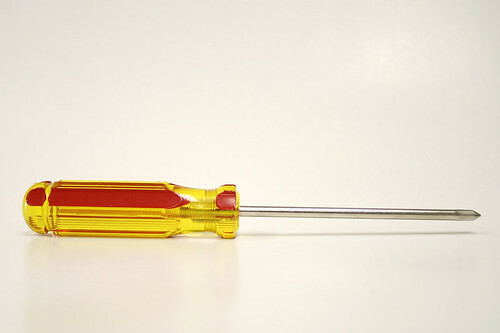 Think about whether you are paying for advice or paying for someone using a screwdriver. For others having the same problem with Sears Kenmore front-load washer model number 417.42042100, made by Frigidaire, unplug the washer and take off about 15 screws on the back panel. The motor control board is located on the bottom left. Unplug the two plastic electrical connectors. Take off two screws and pull the board out. First try replacing the fuse. If that doesn’t work, the replacement board is part number 134149220. AppliancePartsPros.com sells it. I had great service from them. We’ve had minor issues with many of our appliances over the last year, but none so far have been catastrophic. The ignitor in both the oven and the furnace have gone out over the last twelve months, but we have an appliance repair plan through our gas company, and both were fully repaired via that. We also had a failure of our rubber gasket on the washing machine, which was also covered by our plan. We have a leaky dishwasher, but it’s a minor leak (less than a quarter cup per load) that hasn’t gotten any worse, and we just catch it with a pan strategically placed under the dishwasher, and the water evaporates with the end of the cycle, so far hasn’t caused any issues. If the control board had NOT been the problem, he would have put the old one back. Could you have returned the board if it didn’t fix the problem? Yes Steve. I made sure I bought from a place that allows returns. Many places don’t allow returns for electrical parts. AppliancePartsPros.com does. I also bought it with my American Express card which has 90 days return protection just in case. LOL, we all know the answer to that. The repairman’s primary goal is to earn money. Saving you money is way down on his priority list. That reminds me of one time I brought my car into a shop. One of the things the technician diagnosed was a defective oxygen sensor. It would be something like $150 to replace the O2 sensor. Luckily another technician was observing and noticed that the wire to the O2 sensor was frayed. They ended up just re-splicing the wire and the O2 sensor worked perfectly fine. I also saw on local news one time they did a investigation. They pulled out a fuse in a refrigerator and called multiple repairmen. Many of them said that they would need to replace some expensive part that would cost several hundred dollars. When the reporter confronted the repairmen and caught them red-handed on hidden camera. Apparently you don’t think Kenmore is a good brand. What would you recommend? Of course there is Consumer Report for these. Based on my recent experience I would not buy Kenmore again. I expect these appliances to last longer than 11 years. Kenmore doesn’t make the appliances. It contracts out to another company but you don’t know who actually makes it. One model could be made by a low quality manufacturer when another model made by a different manufacturer could be just fine. Sometimes that works – usually if it’s just something transactional. If it’s as easy as turning screws and bolts, most people have the mechanical ability required to do the job. If it requires technical know-how, it’s not going to be enough. Example: I can change my oil on my car. It’s a bolt, a screw-filter, and an oil cap and some elbow grease. I can buy the parts and do it myself pretty easily. If I somehow strip the teeth off 2nd gear in my car, I can buy the parts easy enough, but there is a certain kind of technical ability involved in taking out gears and reassembling a transmission that is beyond what the average person can do (myself included). I think it’s the same way in the financial industry. I don’t like this analogy at all. There are plenty of people who are not mechanically savvy and would much rather pay someone to take care of manual labor things. There is nothing really wrong with this and an extra $300 or so every few years is a lot less than ongoing fees/commissions would be. Managing investments is (can be) far easier, and to make that analogy suggests that hiring an advisor is like hiring a plumber. You may save some money to do your own plumbing, but you’ll also get dirty, physically tierd and sweaty, etc. Managing one’s own investments does not have any such negative side effects, the only effect is that you are saving money when employing a passive investment strategy vs using an advisor for a passive strategy. Unfortunately, some things were not built to last these days,. Overtime anything Thats used regularly well start to go Down hill. I think you got your money worth after 11 years. And of course the repairman isn’t going to tell you to fix it yourself, that’s less money in his pocket. Kenmore isnt an appliance manufacturer, they just relabel other brands. So a Kenmore could be a ge, an lg, a frigidare, a samsung, a whirlpool, or a bosch among others. Saying a kenmore is unreliable is like saying magazine articles are unreliable. Its just too nonspecific, sure some brands are unreliable, some are less so.